Jain Profile is a premier and well-known manufacturer of PVC profiles in India, since year 2000. Its working is enabled by directors having a rich and varied experience of over 15 years in this field. The company's versatile product range comprises profiles for partition ceiling, wall paneling, single piece door, canopy/huts/cabin and an extensive range of PVC furniture. The entire range carries a hologram to ensure genuineness and conforms to superior quality achieved by deep R&D. In addition, these products being substitute for wooden furniture help in preserving our environment. 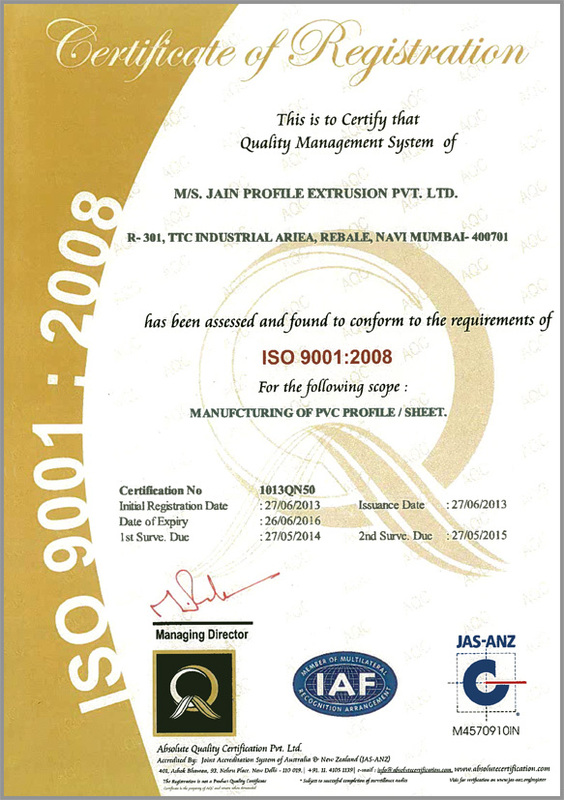 Jain Profile is reputed for its commitment to cost-effective designs and development of customer-specific PVC extruded profiles and sections, as per client's unique requirements within demanding time-frames. This is made possible by their Development Center, which is equipped by advanced tools, dyes, mould designs, ably supported by a modern tool room. Jain Profiles are renowned for Quality and Quantity. A fact, which has won them, the abiding trust of their esteemed clients, for over a decade. There are many advantages of using a PVC doors or ceilings as they are completely water proof, termite proof as well as fire retardant. PVC doors and ceilings saves lakhs of trees every year as it is a wood substitute and can also be recycled. Our products are cheaper compared to wooden doors and POP ceilings and are durable. Customers purchase our products because they trust the quality of our goods. It has took us more than one and a half decade to establish such a brand name in the market where customers would not doubt about the product’s quality and purchase them only because the products have a Jain’s hologram sticker on it. We are known for maximum variety in designs and rollers for printed PVC profiles, more than 500 designs in poster doors. Our products enjoy premium over other products because of the fine glossy shine that no other manufacturer can provide and because of our packaging. The packaging done by us ensures that there is no damage done to the products while loading the goods and also in transportation.